One of the central questions of the French Revolution is what happened to the country from the time the monarchy collapsed in the summer of 1792, when the prospects for popular democracy seemed brightest, to the Terror of 1793–94, when the Committee of Public Safety ruled by fiat and repression. 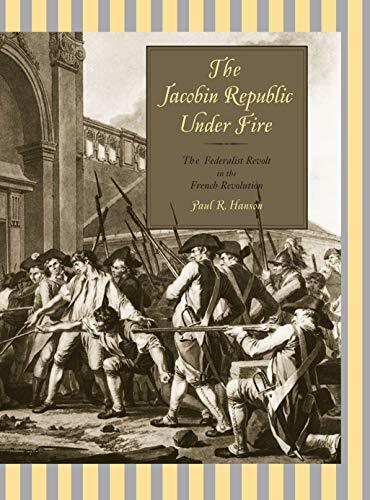 A key moment during this interim period was the so-called Federalist Revolt, when four provincial cities—Caen, Bordeaux, Lyon, and Marseille—rebelled against the more radical revolutionaries in Paris, threatening to plunge France into civil war. Over the years some very good work has been published on the Federalist Revolt, but no one has attempted an overarching study of the event in over a century. It is time for a major work of synthetic interpretation, and this is whatThe Jacobin Republic Under Fire offers. The revolt pitted federalist rebels from the provinces, known as Girondins, against the republican Montagnards (also known as Jacobins) who dominated the National Convention in Paris. The four federalist cities never succeeded in creating a unified resistance to Paris, but the revolt had a substantial impact on revolutionary politics. In July 1793 Maximilien Robespierre joined the Committee of Public Safety, at which time the Montagnards moved decisively to quell the provincial rebels—the first major act of the Terror. Hanson presents a general narrative of the events as well as a pointed analysis that ultimately seeks to identify what, exactly, divided Girondins from Montagnards. According to Hanson, the conflict arose over the question of popular sovereignty: Who are the sovereign people, and how are they to exercise their sovereignty? Paul R. Hanson is Professor of History and Dean of the College of Liberal Arts at Butler University. He is the author ofProvincial Politics in the French Revolution (1989) and the forthcoming Historical Dictionary of the French Revolution.